While you don’t want to live in a house that forces you to crouch down or crawl while you’re inside it, you don’t necessarily need a home the size of Jupiter, either. The bigger your home, the tougher it is to clean. The larger the home, the higher the tax bill, insurance costs, etc. Besides, you can design an abode that is inspiring, eco-friendly and roomy enough for all your needs out of a shipping container or two. You may want to opt for three, four or even more shipping containers to develop the home you crave. But standard shipping container dimensions are fairly sizable, especially when it comes to their capacity. Even the smallest containers are pretty roomy. Our page on shipping container sizes outlines the length, height and width of various containers, while this page features an extensive list of storage container dimensions along with a detailed rundown on the capacity of the most common sizes. When talking about sea container dimensions, we’re talking about the dimensions that make up the shipping container frame. Dimensions of a shipping container that measure 20 feet long also measure 8 feet wide and 8 feet 6 inches high. 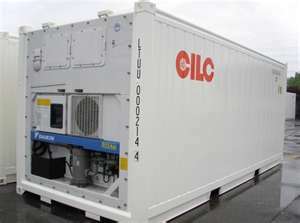 Cubic capacity: 1,165 cu. ft. Interior square footage: approx. 133 sq. 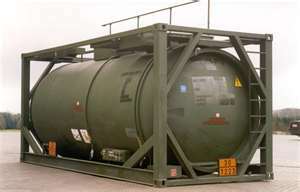 ft.
Half-height storage container dimensions that measure 20 feet long are 8 feet wide and 4 feet 3 inches high. Cubic capacity: 402 cu. 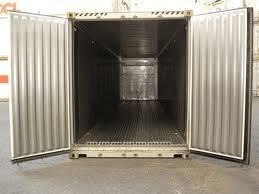 ft.
Sea container dimensions for those 40 feet long include standard and high cube (HC) options, both of which are 8 feet wide. The standard version is 8 feet 6 inches high, while the HC version is 1 foot taller, or 9 feet 6 inches high. 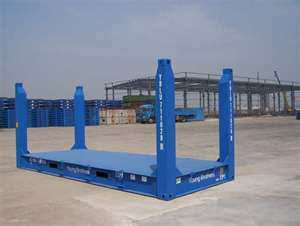 Cubic capacity of standard: 2,350 cu. ft.
Cubic capacity of HC: 2,694 cu. ft. Interior square footage: 273 sq. ft. 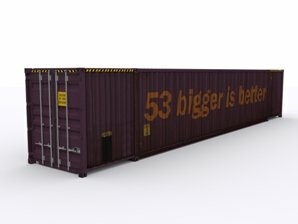 Containers that measure 45, 48 and 53 feet long are available in HC varieties, which is 1 foot higher than the standard cube. All three are 8 feet wide and 9 feet 6 inches high. 45-foot cubic capacity: 3,043 cu. ft. Interior square footage: approx. 308 sq. ft.
48-foot cubic capacity: 3,454 cu. ft. Interior square footage: approx. 376 sq. ft.
53-foot cubic capacity: 3,857 cu. ft. Interior square footage: approx. 416 sq. ft.
How Big are Typical Rooms? To get a good feel of the size and number of containers you’d need to create your ideal space, you can compare the standard shipping container dimensions with the average dimensions of some the most common room types. Remember that the size of a room needs to accommodate the room’s functions as well as the furniture and other items that plan to fit into it. While you may have to adjust your room sizes to suit your exact furnishings and needs, you can spot check the typical room sizes to use as a guide when choosing the dimensions of a shipping container. Small: 12’ x 18’ = 216 sq. ft. Medium: 16’ x 20’ = 320 sq. ft.
Large: 22’ x 28’ = 616 sq. ft.
Small: 10’ x 12’ = 120 sq. ft. Medium: 12’ x 16’ = 192 sq. ft.
Large: 14’ x 18’ = 252 sq. ft.
Small: 5’ x 10’ = 50 sq. ft. Medium: 10’ x 16’ = 160 sq. ft.
Large: 12’ x 20’ = 240 sq. ft.
Small: 10’ x 10’ = 100 sq. ft. Medium: 12’ x 12’ = 144 sq. ft.
Large: 16’ x 16’ = 256 sq. ft.
Small: 8’ x 10’ = 80 sq. ft. Medium: 12’ x 14’ = 168 sq. ft.
Large: 14’ x 16’ = 224 sq. ft.
Small: 6’ x 9’ = 54 sq. ft. Medium: 8’ x 12’ = 96 sq. ft.
Large: 10’ x 16’ = 160 sq. ft.
Small: 2’ x 2’= 4 sq. ft. Medium: 3’ x 4’ = 12 sq. ft.
Large: 4’ x 6’ = 24 sq. ft.
Also account for any foyer space, hallways and any additional function, furnishings or utilities that may need their own area, such the washer and dryer. A few other considerations can come into play when you’re examining the standard shipping container dimensions and planning your container home. If you want the standard 8-foot ceiling height, you’re going to want a high cube container. The interior height of high cube containers is 8 feet 10 inches, giving you a full 10 inches of space for your HVAC, wiring and other connections you need to install above the finished ceiling. The standard shipping container dimensions are 7 feet 10 inches high in the interior, which would leave you with 7-foot ceilings after you installed your connections. High cubes are typically preferred for container housing. The same way HVAC and electrical accoutrements may eat up some ceiling space, your interior shipping container standard dimensions may lose some space due to insulation, wiring and other items you need to install in the walls. Even if the loss is minimal, and even though the dimensions of shipping containers are sizable, any loss of space can impact the overall feel of your container house interior. Even though the containers may come as a fully enclosed unit, you certainly don’t need to keep them that way. You can install plenty of windows, skylights, large, rolling doors or even leave an open space for al fresco dining or entertainment. You can also make use of the roof as a patio or garden area. Placing two containers side-by-side automatically doubles your space, but you don’t have to stick with a boxy, symmetrical look. Container homes have been created with top floors that jut out above bottom floors, creating a shady overhang. You can also play around with different heights by stacking containers on top of each other. Even if you start with a container or two as the base of your home, you’re also free to build on using traditional building techniques combined with a solid foundation of shipping containers. Not all shipping containers are fit for use with ship container homes but we're including dimensional information on these types as well. 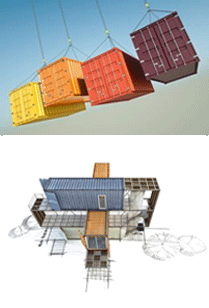 While these cargo container types are typically not used in shipping container home construction, a creative designer might have use for them when designing a modern container home. Length (between top headers): 38' 4"
Length (between corner gussets): 37' 5"
Width (between top rails): 7' 3"
Height (under top rail): 6' 5"
Length (between top headers): 18' 5"
Length (between corner gussets): 17' 7"
Height (under top rail): 7' 3"
Maximum Gross Weight: 71,650 lbs. Loading Line (height): 7' 2"
Maximum Gross Weight: 74,960 lbs. Maximum Gross Weight: 99,212 lbs. Concentrated Load Over Center 2 Meter Span: 56,000 lbs. Length (between end panels): 39' 6"
Length (between corner posts): 38' 3"
Width (over bottom side rail): 7' 2"
Width (between corner posts): 7' 7"
Height (side rail to top casting): 6' 4"
Maximum Gross Weight: 74,950 lbs. Concentrated Load Over Center 2 Meter Span: 44,094 lbs. Length (between end panels): 19' 6"
Length (between corner posts): 18' 2"
Width (between corner posts): 7' 3"
Height (side rail to top casting): 7' 2"